Little baby outfits like this one are so satisfying because they don’t take much time or many materials. A small amount of baby flannel became basic baby pants, to which I added a leg ruffle for fun. Then I made a small applique with a scrap of fabric and sewed it onto a plain bodysuit. I’ve done a similar thing to bodysuits that were given to us but I didn’t like the design on, but this one was just a nice, soft, plain white one. 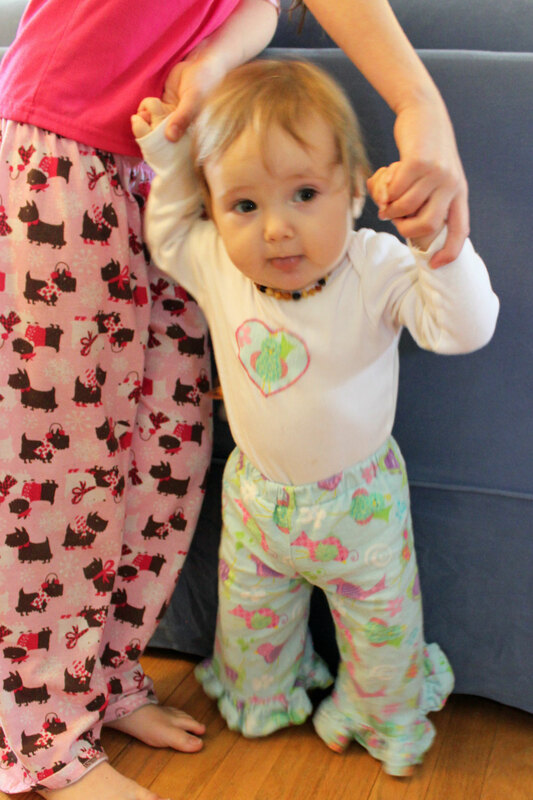 The pants were a little too long, so I’ve turned up a basted hem on the ruffle, which makes it a little stuff, but I think I should be able to take it back out easily in a couple months when she’s taller, and then these pants should be favorites all winter. A really sweet ensemble. Great idea.